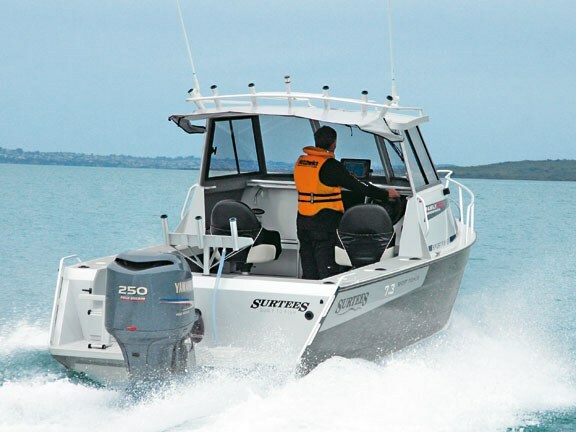 The Surtees brand is synonymous with innovation and quality, and the Surtees 730 Sport Fisher is no exception. 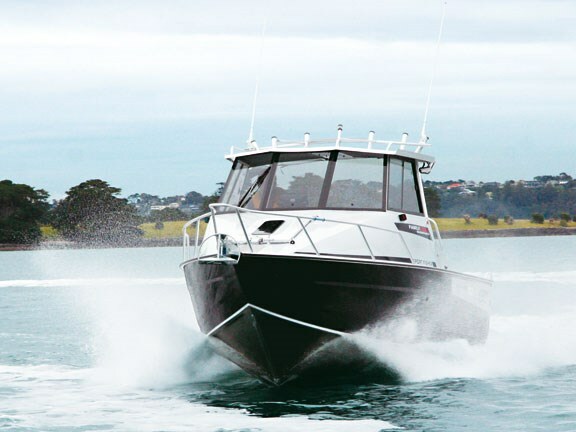 Launched at this year's Auckland On-the-Water Boat Show, the 730 is Surtees' launch platform into 7m-plus boats. While Surtees has built a number of larger 8m designs, these have been one-off custom projects built to commercial specs for various inshore and offshore applications. The new 730, available in a variety of enclosed and open hard-top configurations, has been tooled for general production. The first of the design - and the demonstrator for this review - struck a chord with the boating press, winning a 'best-in-class' award at this year's National Boat Show. Awards are nothing new for Surtees Boats and more might have been said had this new boat not won its class. 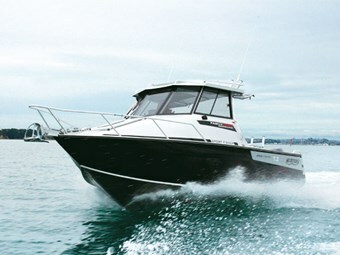 The 730 is basically the same boat as the popular and proven Surtees 6.7m Sport Fisher. While roughly 7" bigger all round, it is essentially a stretched 6.7m engineered and built on the same design drawings. There are, of course, minor refinements and additional options, but hull design and construction is stock-standard Surtees. And that, says Family Boats' Tony Singe, is what the market wanted and is comfortable with. "Owners of Surtees 6.7m, 6.1m and, to a lesser degree, 5.5m Work Mate designs, have had few options to upgrade their existing Surtees. We've always believed there is untapped market potential for the Surtees brand in the 7m class. The 730 is a comfortable progression for these owners and we expect corresponding sales success." While the economy is hardly conducive to big-ticket purchases, Surtees Boats report orders for 10 boats, which is tracking above its initial production estimate of one 730 a month. While company owner and founder Neil Surtees is no longer 'on the tools', it is useful to consider his contribution to aluminium trailer boat design and his innovative and sometimes unorthodox approach to boatbuilding. A boilermaker by trade, Surtees was one of those guys who took things apart just to see how they worked. Then, with the widget in bits on his shed floor, he would reassemble, adding or removing parts as he saw fit, arriving at an improved, albeit unorthodox, solution that performed its job better, faster and cheaper than the original. His introduction to boatbuilding goes back 20 years when he picked up a welder and built the first of several jet boats for his own use. These early designs and the workmanship that went into them did not escape local attention and Surtees' hobby took on a life of its own. It is Surtees' ability to visualise ideas and designs that sets the brand apart and has resulted in rapid growth in the last decade. Surtees now produces more than a dozen models based on four designs that range from 5.5m to 7.3m. The company's WorkMate, available as a 5.5m, 6.1m or 6.7, continues to be the its bread and butter model. The WorkMate is a working boat optimised for no-frills fishing. 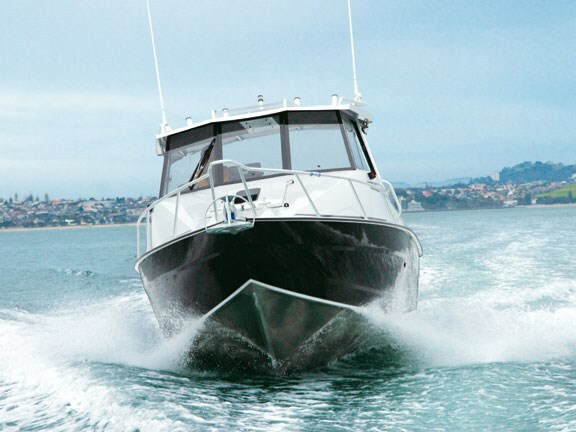 The company's BarCrusher and Sport Fisher models are more sports-orientated, with a fixed hard-top and build options that extend to a galley, enclosed head and lockable cabin. Both the WorkMate and BarCrusher are exported to Australia and marketed under the single BarCrusher badge. The new 7.3m Sport Fisher is an open hard-top model with a central lockable cabin door. The same boat is available with a fully enclosed hard-top and marketed as the 7.3m Game Fisher. An entry-level option is also available with an open hard-top but without the cabin door. All three models are built from marine-grade aluminium and specified with 5mm plate hull, 4mm topsides and a 4mm checker plate floor. The hull is strengthened with six full-length stringers from the transom to the bow. Welded gussets are placed every 400mm and capped with a solid checker-plate floor, forming two pressure-tested under-floor buoyancy chambers with a central under-floor fuel tank. The 730 design incorporates Surtees' "quickflow" water ballast system and "waveslicer" hull form. None of Surtees' designs have planing strakes or typical chine rails. Surtees maintains that planing strakes serve only to aerate water passing under the hull, resulting in unnecessary cavitation. The 730 hull has the same exaggerated forefoot and deep, fine entry bow fitted with a single externally-welded aluminium extrusion spray rail that extends aft roughly one third of the hull's waterline length. The hull has a variable deadrise culminating at 18 degrees at the transom. Much has been written about Surtees' water ballast system. Simply put, it is a free-flowing tank welded into the hull above the V in the stern. The tank follows the centreline and runs the full length of the hull. Stop the boat and the tank floods, in this case with 450 litres of seawater - about 400kg of ballast. This extra weight down low improves the boat's stability when stationary. It is also useful ballast in rough conditions. Put power on and the tank empties of its own accord in less than 10 seconds. The ballast tank entry is fitted with a triangular gate that is opened and closed by pulling a single braid line. Like its 6.7 Sport Fisher stablemate, the new 7.3 is a good-looking boat with its angled three-pane toughened-glass windscreen, relatively low profile hard-top and external styling. As a demonstrator, the hull of the review boat is finished in a quality two-pot black marine coating with colour-matched graphics and sheer stripes on the hull and cabin superstructure. Several items jump out as being different, including Surtees' large rectangular aluminium forward hatch. This is fitted with a small acrylic sealed window for natural cabin light. The advantage of size is easy access to the anchor. The disadvantage is a large hatch footprint, which heightens the risk of foredeck leaks. And in this case, the rubber hatch seal did not look completely convincing. The 730 Sport Fisher demonstrator was optioned with a full cabin bulkhead and central aluminium sliding door that slides in behind the bulkhead on the port side when open. The door is certainly solid and fitted with a strong locking arrangement. It is not, however, set on any form of runner and requires a reasonable effort to slide it closed. A door handle or similar fitting would be a useful addition. With its fine entry and long forefoot, cabin volume is not huge but it does provide sitting headroom and can be optioned with an electric macerator toilet mounted between the V berth squabs in the bow. An optional infill squab is available to create a large berth for the more adventurous. The cabin is fully-lined and tastefully upholstered with twin parcel shelves. An internal access hatch is fitted to the forward bulkhead for internal access to the chain locker. The 730 Sport Fisher has Surtees' signature portofino stern with full-length transom and walk thru located on the port side incorporating the live-bait tank. The transom and side decks are wide and provide clever storage options. 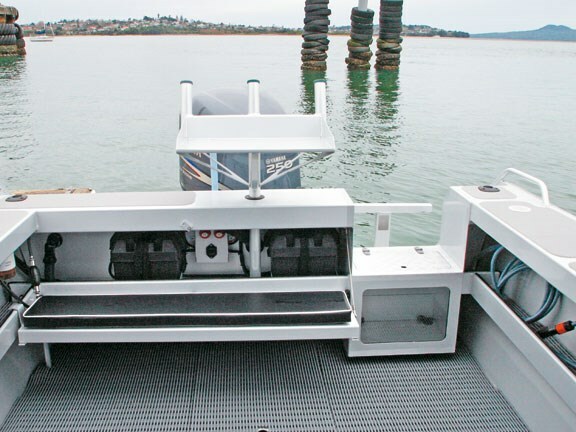 A single-level battery shelf is fabricated under the transom and enclosed with an upholstered hinged panel that forms a basic bench seat when folded out. 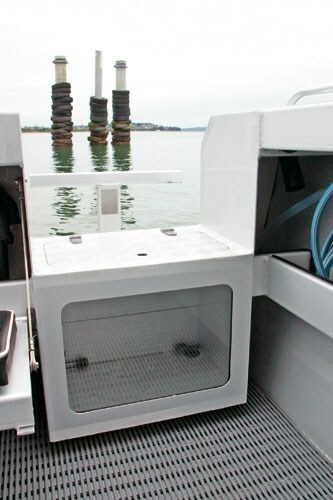 Utility lockers have been built into the side decks for bait and tackle and full-length cockpit storage racks take care of rods, gaff, fenders and spare cordage. Various seating options are available depending on your application. The demonstrator had a single gas-assisted pedestal on the driver's side fitted with a fold-out lumber support and a king/queen fiberglass unit had been fitted on the passenger side. 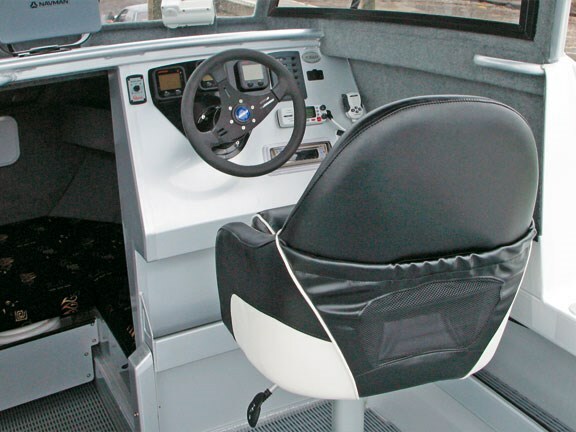 Like many aspects of Surtees Boats, upholstery is designed, manufactured and fitted to boats before they leave the factory and the standard is consistently high. An unusual but noteworthy feature of the demonstrator is a small sink unit and double row of cup holders built in on the passenger side of the hard-top. Equipped with a fresh water tap plumbed to a 75-litre tank and small sink, it is an ideal accessory for those who enjoy a cuppa or freshwater splash down. Surtees hard-tops are solidly engineered and equipped with a welded rocket launcher and external handrails where required. The demonstrator featured sliding side windows and a canvas cockpit bimini sunshade fitted to the aft end of the hard-top. The hard-top roof has guttering with excess runoff draining through the aft hand rails and out overboard. 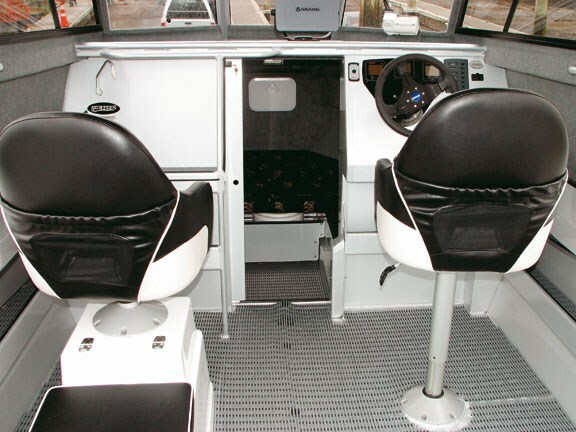 Keeping with its fishing heritage, the 730 cockpit is an open platform, completely free of obstacles to get between you and your fish. The cockpit combings are covered in non-skid and fitted with three rod holders each side, flanked by recessed plastic sinker cups or drink holders as required. The high-spec demonstrator was fitted with rubber tube matting and all alloy surfaces had been sprayed with Nyalic protective coating. The helm station is thoughtfully laid out and solidly engineered with wiring looms discretely hidden behind aluminium panels. These can be quickly and easily removed for maintenance or running cable for additional electronics. The instrument panel and dash is lined and designed to accommodate large-screen instruments. It also incorporates a curved and shielded pod for engine management instruments. 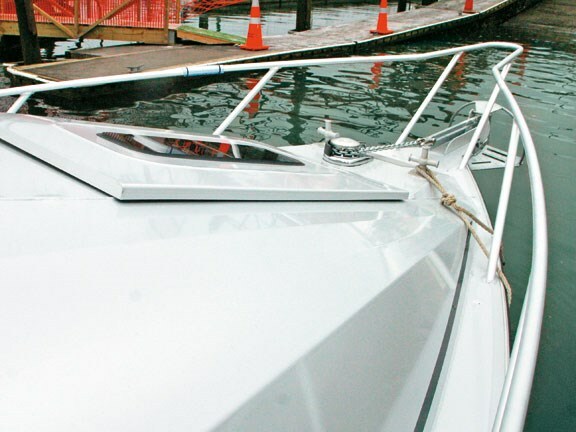 Hand holds and foot rails are well placed for secure passage around the boat when under way. At 1350kg, the 730 was ideally matched to the Yamaha F250 six-cylinder, four-stroke outboard fitted to the demonstrator. Recommended power options range from 200hp to 300hp. With winter boating being what it is, one couldn't help feeling cheated having to test the boat on a flat calm sea with no breeze and a light, dreary Auckland drizzle, as the photographs suggest. So what can I tell you? Perhaps the most pertinent observation is that the 730 feels like a solid boat underfoot, with no annoying creaks or groans. The hydraulic steering is positive and firm and the boat tracks perfectly without a pilot. It is the sort of boat that you know is without vices - being a development of the proven 6.7. Like the 6.7, the 730 can be thrown around at will. The fine-entry bow and extruded spray rails take care of wayward spray and a dry windscreen at the end of the day speaks for itself. Surtees Boats have a reputation for soft-riding hulls and there is no reason to suspect the new 7.3 Sport Fisher is any different. The overriding impression of the 7.3 is that it is a quality package. And while short on some of the frills finding their way onto similar-sized trailer boats, engineering, construction and practicality are excellent. Coupled with Surtees' own tandem-axle multi-roller trailer, the Surtees 730 Sport Fisher is quite a rig and would look good in anyone's drive. Boat supplied by Family Boats, 247 Ti Rakau Dr, Auckland. Tel: (09) 274 0511.